Welcome from the Friends of the Villa Montezuma, Inc. (FOVM), the nonprofit 501-c-3 organization solely devoted to the magnificent Villa Montezuma. 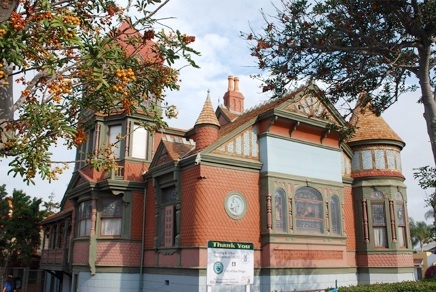 We welcome you to San Diego’s most amazing Queen Anne Victorian house museum and cultural center. The Villa is listed on the National Register of Historic Places. The museum is owned by the City of San Diego and is currently open quarterly for free interior tours by the FOVM. FOVM MEMBERS: RSVP to FOVM@VillaMontezumaMuseum.org for the FOVM Annual Meting on Saturday, April 13, 10:00 - 11:30 to be held at the Sherman Heights Community Center at 2258 Island Avenue, San Diego. Light refreshments. Free parking. NEXT TOURS: See inside on June 1, August 17, and October 19, 2019! Registration for the June 1 tours is not yet open at www.SDRecConnect.com. However, you can go there now to create an account and add any family or friends that will join you on tour. When registration is open (we’ll post here when it’s open) you would then search for “Villa” (not “Villa Montezuma”) to see the seven tours. Click on the tour you wish, then before you “check out” (it’s free), add the other family and friends you put on your account. Email or text us if you need help with registration. 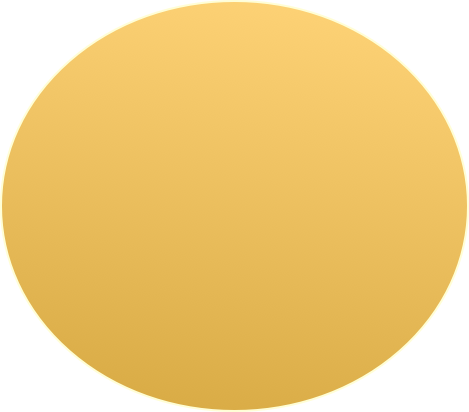 Day of the event please carpool. Check in at the City booth in the back yard (bring the email confirmation with you to help City staff). We will take walk-ups, but you’ll need to fill out the City’s liability waiver form at the City booth. Get to the museum at least 15 minutes before your tour time to check in. It will be crowded but worth every second to see this extraordinary Palace of the Arts! The Villa Montezuma is the Historic Jesse Shepard/”Francis Grierson” House. It was built in 1887 as the home of world famous pianist, author, and Spiritualist Jesse Shepard. Jesse began a writing career in San Diego and took the pen name “Francis Grierson,” a name that he used in life as well as for his writing. 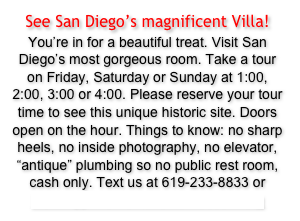 The Villa is located in the Sherman Heights Historic District of downtown San Diego, CA, at the corner of 20th & K Streets. The Sherman Heights Historic District is the largest historic district within San Diego; it has almost 400 contributing historic structures. Learn more by scheduling a walking tour for your group of 10 or more guests. In 2015 the restoration of the foundation, roof, and chimneys was completed thanks to a Community Development Block Grant (CDBG). Because of this federal grant, the museum must be open four times each year at no charge to the public. 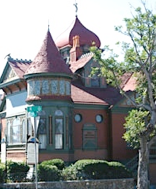 The FOVM conducts these historic tours on behalf of the City of San Diego, owner of the museum. The FOVM is working with the City of San Diego to restore the museum exterior. You’re invited to join the FOVM to make a difference in the Villa’s future. Read more about it!Jesse Shepard wrote metaphysical essays and books under the name Francis Grierson. His only “novel” was a fictionalization of his boyhood growing up on the Illinois prairie, “The Valley of Shadows.” This work is his most famous. Note: British mystery writer Francis D. Grierson (who wrote from the 1920s to 1040s) is NOT our Francis Grierson.